Turn the lights off without getting out of bed! Turn your bathroom pink! Wake up to an indoor sunrise! These are just a few of the things you can do with the Philips Hue “smart” lightbulb starter kit. I’m going to guess that Google brought you here after searching for something like, “is Philips Hue worth it?”. I mean, come on, $200 for lightbulbs? That’s pretty crazy, right? The short answer: it’s a little crazy, but they are awesome. Why live with boring bright white lights? Hue is easy to set up, convenient for day-to-day use, and there are only a few hiccups to be aware of. There’s a reason the Hue Philips starter kit is one of Amazon’s most popular home automation products! So FUN! Sunset colors, all bulbs to soft pink, and deep blue/purple are my favorites. LEDs are immortal – supposedly good for 15,000 hours and 15 years. This will be ancient tech before the bulbs burn out. Save energy – Use 80% less power than traditional incandescent bulbs. Remote control lights – you don’t even have to get off the couch to dim the lights for movie time. Home automation ready – use with Amazon Echo or Apple HomeKit (+ Siri) for that Star Trek feel. Also works with Zigbee, If This Then That (IFTTT), and a whole slew of other home automation systems and apps. $60 light bulbs! Sticker shock is probably the biggest downside of the Hue system. I didn’t find enough wrong with the Hue bulbs to stop recommending them to everyone who shows the slightest interest in home automation or making their home prettier. 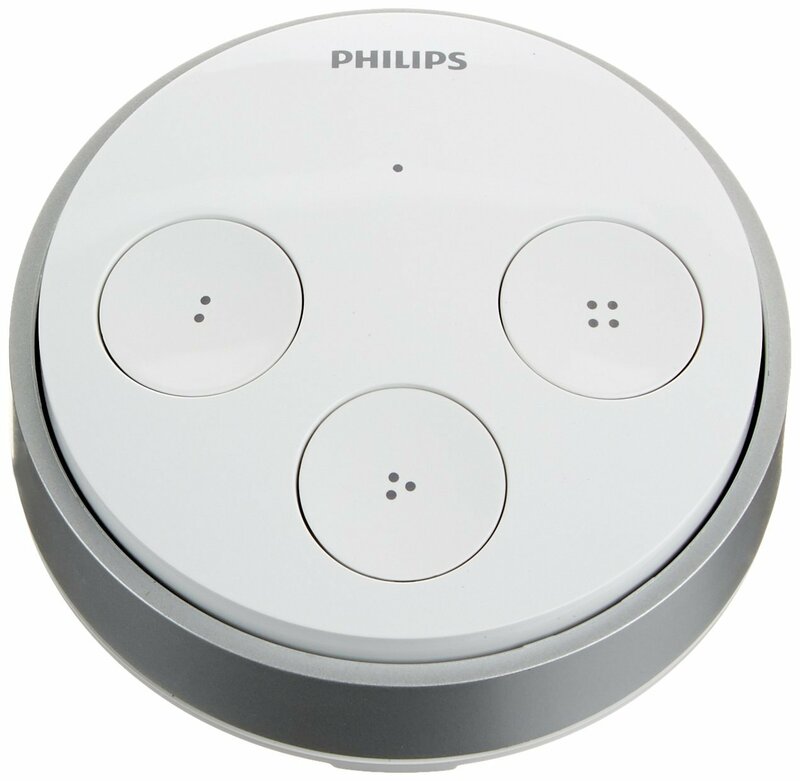 Philips will continue to update the app and roll out updates to the system, too, so it will only get even better. The Philips Hue family is a collection of bulbs and hubs you set up in your place, hook up to your WiFi network, and control from a smartphone all. The central piece of equipment called a “bridge”. 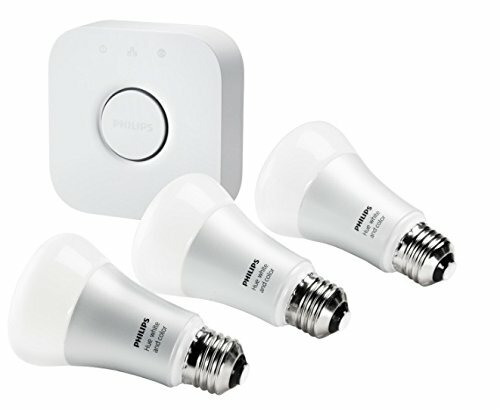 This review is for the set I own, the Philips 456210 Hue White and Color Ambience Starter A19 Kit. Philips Hue A19 starter kit manufacturer photo. This is what’s in the box, plus some printed instructions and a power cable for the bridge. This starter kit, first made available in the US in early October 2015, can be distinguished from its predecessor by its square-shaped bridge design (as opposed to the previous starter kit’s circular bridge). The new bridge adds Apple HomeKit support. If you have the old bridge and want HomeKit integration, Hue will sell you the new bridge at a discount through the end of 2015. The Hue bulbs themselves are compatible with either bridge. Terminology note: “A19” is the bulb design. 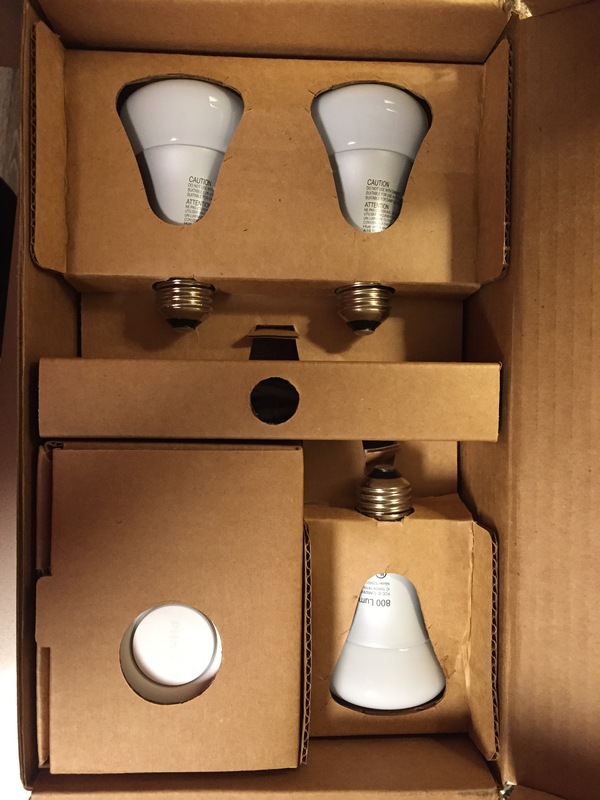 I’ll admit it: when I first heard of Hue bulbs, I thought $200 was ridiculous for lightbulbs no matter how smart they might be. My mind was changed by a friend with an apartment full of Hue bulbs (and an eagerness to show me how cool they are). Apparently, the novelty hadn’t worn off in the year that he’d had them. Mood lighting at the touch of a screen! Turn lights off from bed! Set up lights to turn on as you arrive home! Control the lights through Echo! Okay, fine, I wanted some of my own. 😀 I bought the Philips Hue starter kit for my own apartment, set it up, and tried it out for about a month before starting this review. In short, I love them. I love tinting my apartment various colors to suit my current task or whims. Dimming everything to 15% or so is that sweet spot between “total blackness” and “probably won’t trip on the clothes I left on the floor”. I definitely want more bulbs! Tucked in: three Hue bulbs and the bridge encased in cardboard armor. Unpacked: everything in the starter kit box, plus a brief printed setup guide. Setup was painless, even by modern standards. You’ll need your smartphone on hand to complete the setup process. Bulbs: just screw ’em in and flip the switch on your lamp or wall to “on”. It’s that simple. Bridge: the included printed booklet covered all the steps, and for me it was about as simple as plugging the bridge in and pressing the big button. My Hue bridge doing as bridges do. 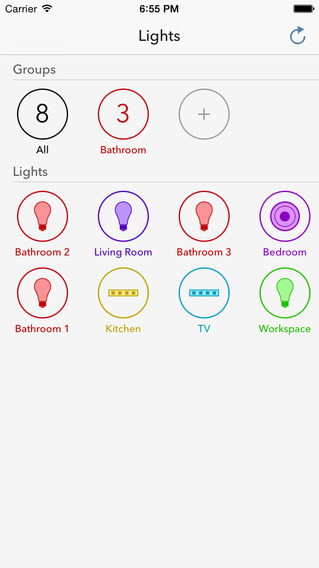 App: searching for “Philips Hue” on your device’s app store will reveal a multitude of options. For completing installation, though, you’ll need the official app. iOS: Philips Hue app (Apple Store). Lighting has a powerful effect on one’s mental state. I thought my apartment instantly became 1000% more welcoming when lit with a mix of soft red and yellow lights (the built-in “Sunset” setting is great). Set fairly dim, this combination is reminiscent of a late summer sunset and I just love being in it. For TV time, I have a custom palette set up to that turns the three bulbs a dim pink, purple, and blue – just enough to offset the TV’s bright glow, not too much to detract from the screen. It’s beautiful. For bedtime, I dim everything to 10% or so as I get into bed and leave it that way until I’m ready to fall asleep. I like this much better than having a 40W bulb next to me on my nightstand and then plunging directly into darkness when it’s time to fall asleep. Want the lights to gradually brighten starting at 7:00am and reach your desired brightness by 7:20? You can do that! I found this to be a very humane alternative to an audible alarm and it was effective at waking me by a particular time. It is really, really nice to control the lights from bed. I’m not even that lazy, but it’s just so wonderful. also love leaving for work with the place nicely lit, knowing they’ll turn off once I’m outside the geofence radius, and coming home to my apartment already lit up. With an Amazon Echo, you can step in the door and announce, “Alexa, turn the living room to 80%” or “Alexa, turn the lights on”. No fumbling for a light switch or phone. I recently added an Echo to my apartment and so far the two systems are getting along like old pals. The only complaint I have is I can’t change the colors or scene through Echo, but I’m hoping that’ll come in a future update. First off, let me point out that you aren’t limited to using only the official Philips Hue app to control your lights. Hue made it possible for anyone to develop apps/systems that hook into Hue, so there are already a number of good alternatives, like Hue Pro for iOS and Hue Pro for Android (Hue Pro is the best, and it just became available on iOS in addition to Android). In the official app you get the basic stuff, of course: you can turn the lights on/off, set timers, group lights, name them, set up geofencing, etc., but the app falls short in some noticeable ways. No “preview” on your saved scenes built from the color picker. Hue Pro on Android gets this right, showing a set of colored dots to represent a saved scene, but the Philips Hue app just defaults to a rainbow spectrum icon for every saved scene. Can’t color match to Hue Lux bulbs. That’s kinda poopy if you have a mix of Lux (white) Hue bulbs and rainbow Hue bulbs and you’re trying to get all your whites consistent. Geofencing kept flaking out on me! Geofencing: when I’m inside the “fence” radius the lights are on; when I’m outside it, the lights turn off. I loved geofencing when it worked, but it seemed like 1 time out of every 5 or so I’d come home to a dark apartment. The geofencing just seems to fail every once in a while. I run a lot of errands on foot near my apartment, so I have a theory that I’m just too close or dipping in/out of radius too much. The Hue app lets you adjust the geofencing zone through arbitrary sizes like “small”, “medium”, “large”, and “maximum” and switching to “small” didn’t seem to make a difference. How does it work with home automation systems like HomeKit and Amazon Echo? Half the fun of having smart things around the house is in controlling them with your voice and/or as part of a larger collection of smart things. For this review, I tried Hue with a few different popular home automation hubs to get a feel for how well integrated Hue is with each of these systems. This feature works about as well as Siri ever does, with some notable shortcomings. Most notably absent: there’s no way to control lights by room. There is, however, the ability to set lights to a color, which isn’t supported by Amazon’s Echo at the time of writing, so that’s neat. Hue and Echo together is pretty friggin’ sweet and I preferred it over Siri. My apartment is small enough that I can just bark, “Alexa, turn the lights off” as I leave my unit and it works. It also works faster than Siri, which had a noticeable few-seconds delay on every lights command. At the time of this writing, you can’t use Echo to set a room to a particular color palette or scene, so I guess Siri’s got the edge there, but most of the time I’m only trying to turn lights on/off or dim them. I couldn’t get this to work at all. Granted, all I tried was a recipe for blinking the lights whenever I got a Facebook message, but it just didn’t work. Didn’t work for my Android friend, either. Too bad, we really wanted this one. What other cool stuff can you do with Hue bulbs? As if in recognition of its own shortcomings, the official Hue app includes a list of other Hue-compatible apps for your consideration. I tried a bunch of apps to see what creative things other developers came up with for the Hue bulbs. Some of these were pretty good, but I still do most of my Hue control via the official Hue app. 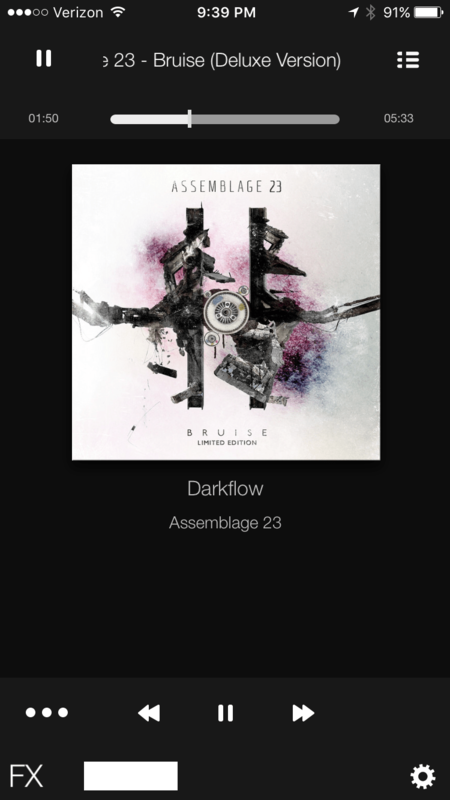 Ambify – (iOS) Syncs the dimming and color shifting of the lights in tune with music from your own phone. My nested iTunes playlists didn’t display in order but I managed to find them. The gradual shifting of the lights is pleasing (turn down sensitivity and other settings to soften the strobing effect). I’ll use this app again but it’s a novelty, not something to use every day. Hue Plus – (iOS) Bare bones, super simple control over individual lights and their colors. A+ for simplicity. Hue Disco – (iOS | Android) Make your lights strobe! It’s a novelty, but it’s a well-done one. The lights seem to sync a little better with this app than they do with Ambify but there’s a little bit more of a learning curve. IFTTT – “If this, then that” statements are useful for automating simple digital tasks. I tried getting mine to make the lights flicker anytime I got a Facebook message, but it never worked. Boo, hiss. 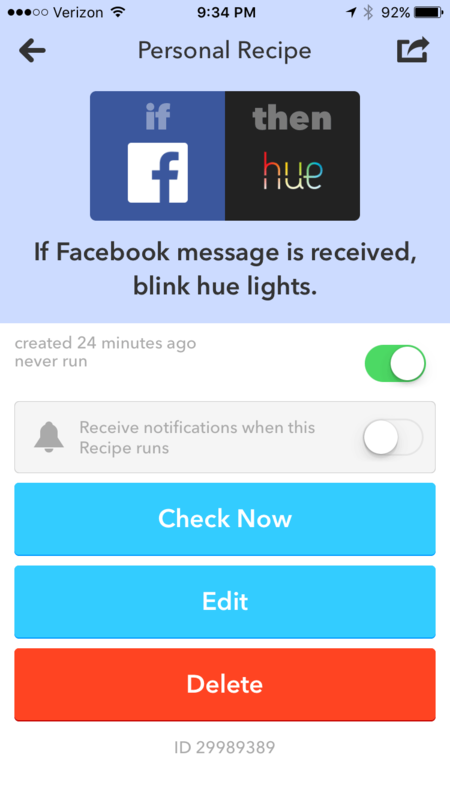 I included it here anyway because I think there’s a lot of potential in IFTTT + Hue. 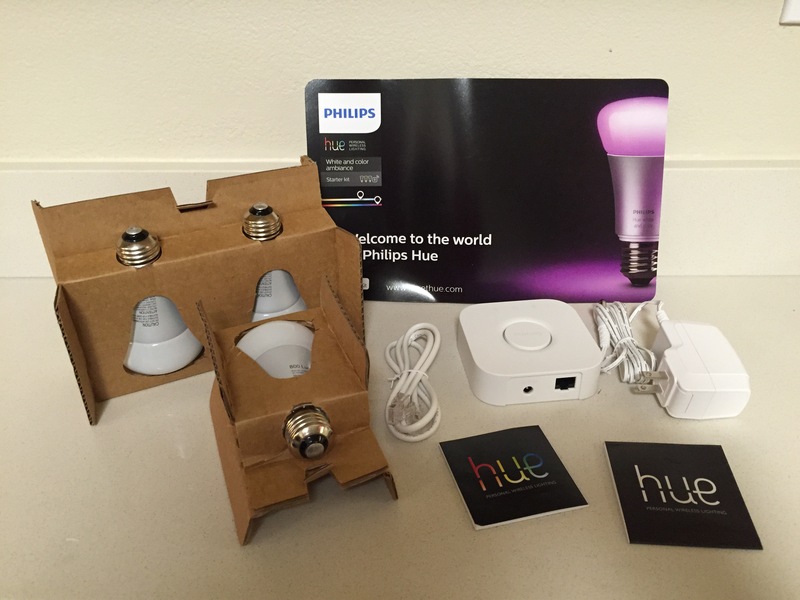 The Hue white kit is an affordable alternative to the rainbow bulbs set. They do everything except colors. Kit includes a bridge and two white bulbs. 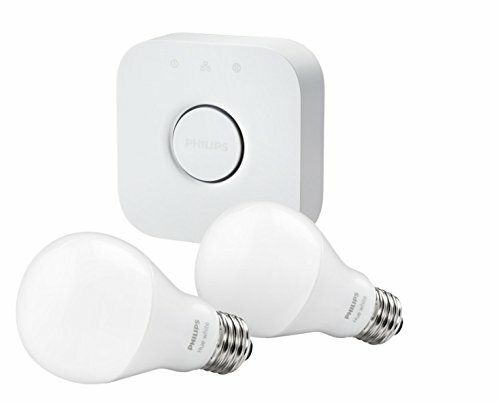 Philips HueWhite Starter A19 Kit – This kit is the “white bulb” alternative to the one I own. It includes a bridge and 2 LED bulbs that glow a soft white similar to incandescent bulbs. These bulbs don’t do colors (just dimming/intensity) but you can control them through an app and put them in the same network as any rainbow Hue bulbs you might own. This bridge can also control the rainbow bulbs, if you decide to add some later (you can add up to 50 Hue-system bulbs to a single bridge). You can also buy solo white Hue Lux bulbs. Get some of these for the places in your home you want smart, app-accessible bulbs but don’t really need to have rainbow light effects. They’re about a third the cost of the rainbow bulbs. Completely wireless and battery-less, the Hue tap switch is like a little remote control for your Hue bulbs. Philips Hue Tap Switch – Place it anywhere (no wires needed, wall-mount capable) and control your Hue lights with the tap of a button. You configure the buttons yourself via the app, assigning scenes or behaviors to each button. Philips say it’s good for 50,000 clicks, so make ’em count. Hue Bloom: A small lamp that can be used to cast a soft light on a wall. It must be plugged in. 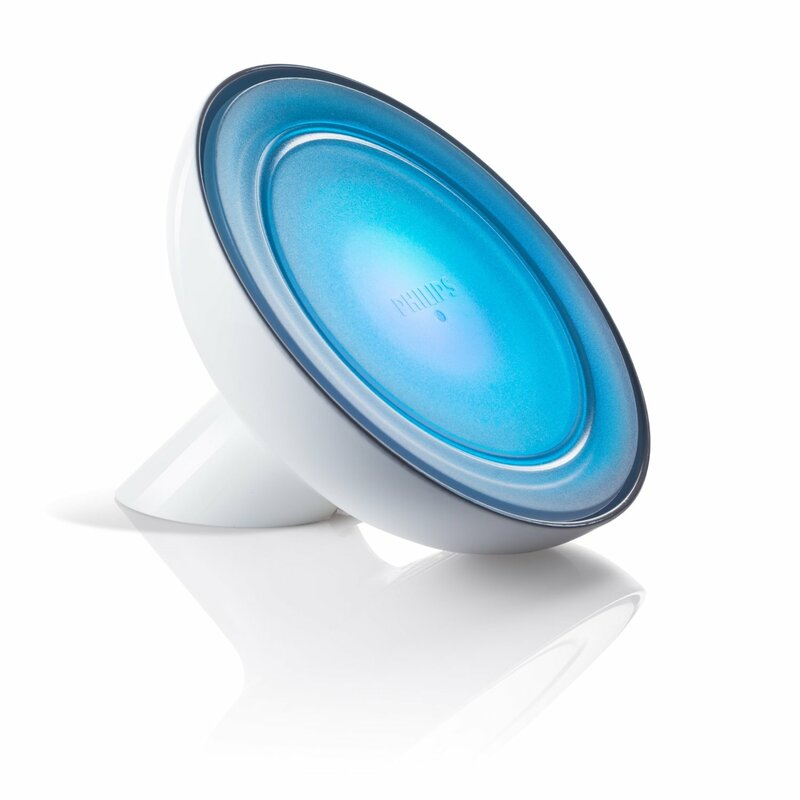 Philips “Friends of Hue” Bloom – I think it’s gone off the market. We got a Bloom in late 2016 and set it to a dark red color with the Hue app. At 1% brightness, it makes a nice soft light for our baby’s room. 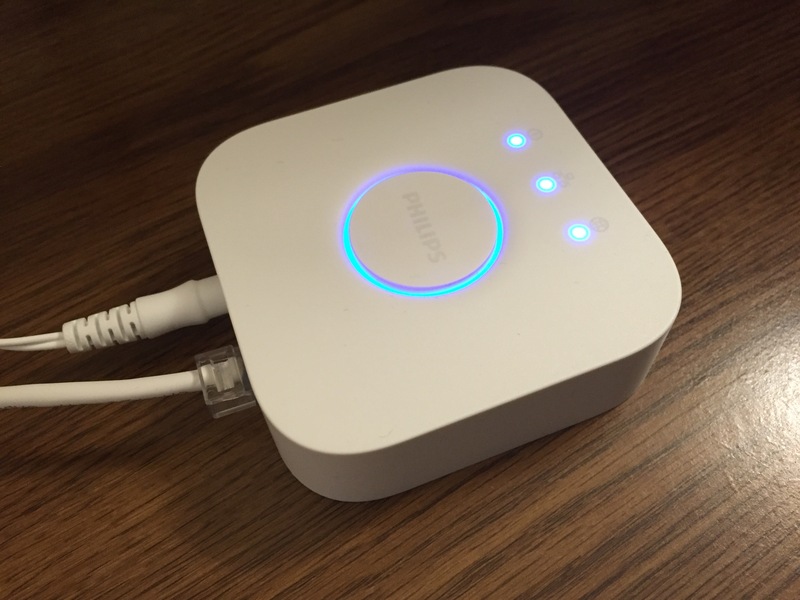 Philips Hue bulbs are a great way to jump into home automation. The general ease of setup and daily use make them perfect for anyone who can operate a smartphone. For apartment dwellers, they offer a wonderful splash of color that may otherwise be absent in a basic, white-walled unit. There’s enough useful functionality here to justify the cost and elevate Hue above “novelty” status. Note to readers: Some links on HomeUpgraded.com are affiliate links. Read our full disclosure policy here. 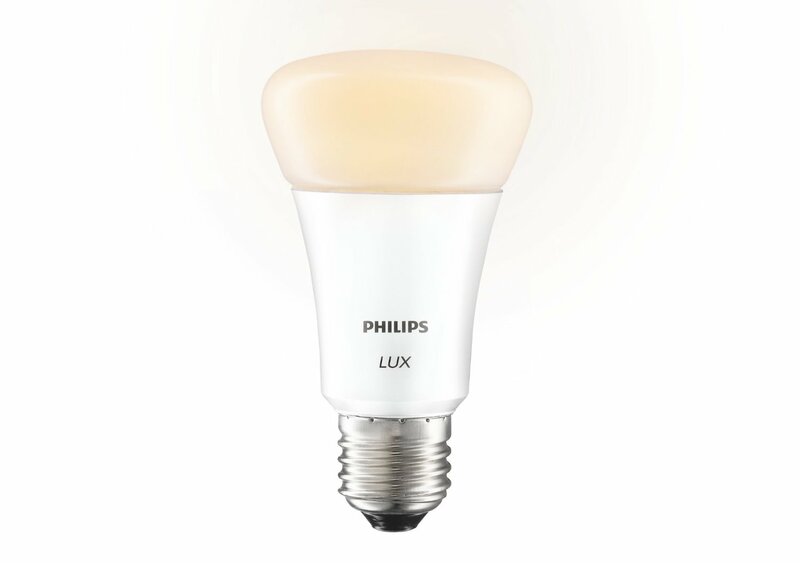 New to Philips Hue? This is a good review of the Philips Hue with so many details. Correction to last paragraph – the Bloom is not the product that has a battery or is perfect for illuminating large spaces. That would be the Go. The Bloom is a dim (40 watt equivalent) accent light. They are similarly shaped. Thanks, Will! I updated the article. We actually got a Bloom in late 2016 and we still use it today as a soft red fill light for our baby’s room. At 1%, it’s just enough to walk around in there without tripping over something. Looks like it might have been retired from the Hue line in the meantime, though.